Ten years ago, Bitcoin was born. Something about it has died. (Bloomberg Opinion) --Everyone remembers where they were a decade ago, right? I'm not talking about the collapse of Lehman Brothers. I mean the Bitcoin white paper of Oct. 31, 2008. It outlined a type of online peer-to-peer electronic cash that would bypass financial institutions -- which the author blamed for abusing people's trust, creating credit bubbles, and charging big fees. Ironically, Bitcoin and its hundreds of cryptocurrency imitators went on to show the world how to replicate the worst excesses of the financial system they were supposed to displace. There are obvious differences in terms of size and risk. 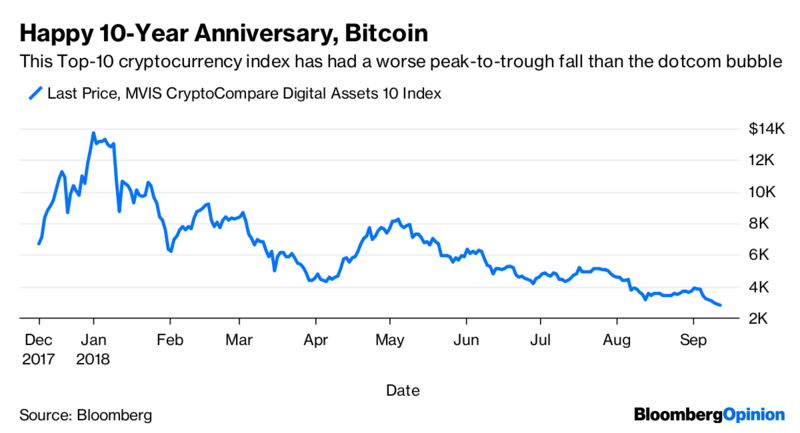 Crypto is hardly systemic -- its total market capitalization has fallen from about $800 billion to $200 billion without triggering an economic crisis or requiring the intervention of central banks. Winding down Lehman's $600 billion balance sheet proved legally complex and painfully protracted. But the $600 billion of value destroyed in crypto still blew a hole in individuals' savings, burned investors who were convinced this was a “new asset class,” and led to more reliance on centralized institutions – the very thing Bitcoin was intended to discredit -- to clean up the industry. And just as Lehman's bankruptcy process hasn't quite finished, we haven't even conducted a full reckoning of where all the money in crypto has gone. There are 900 cryptocurrencies listed as “deceased” – the investors who backed them have lost out, but the founders who raised the cash might still have walked away with the proceeds. Bitcoins still exist, and change hands for about $6,200 apiece these days. Supporters will say that's six times more than the price in early 2017, and that there's no need to call an undertaker. But something has died. We have seen plenty of glimpses over the past decade of a future where technology erodes banks' ability to make money -- just look at how the market value of payments firm Adyen NV's now surpasses that of Deutsche Bank AG. Yet those hoping that Bitcoin's 10-year anniversary would be much sweeter than Lehman's have been proven wrong.